For more than 40 years Maple have been providing high-quality installation services for a plethora of ancillary equipment into commercial vehicles. We are proud to be able to offer a complete end to end installation services on a wide range of products, catering for one-off installations right through to large scale roll-out programmes. You can be confident that when you select Maple Fleet Services for any installation project, that you are in the hands of professionals. With a large team of highly skilled, strategically based service engineers throughout the UK, we are uniquely placed to handle projects of any size across any number of sites. Today’s commercial vehicle fleet doesn’t stand still for long, overnight deliveries to the furthest reaches of the land with short turnaround times and tight schedules – quite simply operators can’t afford for vehicles to be off the road. Which is why, wherever and whenever you need us, we’ll be there. 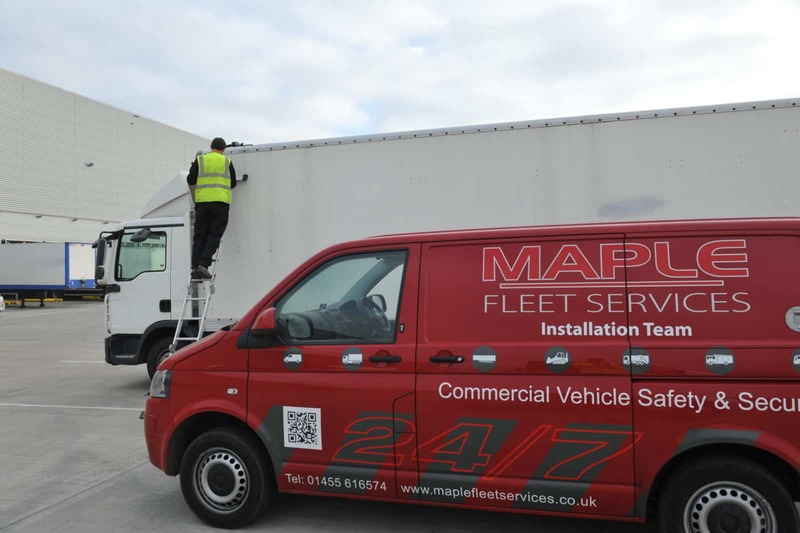 With a large team of auto electricians and service engineers based right across the land, Maple Fleet Services have the capabilities and resource to meet the demands of any project, anywhere in the UK to your schedule. Vehicles only available overnight? No problem! Weekend installation? We’ve got you covered! Whatever your installation requirement, Maple Fleet Services have the resources to deliver! Our team of mobile engineers are on call 24hrs a day 365 days a year, we’ll support any equipment installed by Maple engineers, anywhere in the UK. So if you or your clients ever experience a technical problem, simply contact our service centre and we’ll respond quickly and efficiently to your call-out. Upon choosing Maple for any installation project, you can be confident that your vehicles are in the hands of experts. All of our installation engineering staff are trained motor vehicle technicians to a minimum City & Guilds standard and have completed the Mobile Electrical Certification program, including training in security and cellular installations. We regularly assess our technicians to ensure their training on a diverse range of products we install is up to date and relevant to the diverse range of installations we undertake. To ensure our own exemplary standards are always maintained, our engineers are independently monitored. This means that any engineer, at any time, can receive a visit from an assessor on an active assignment for a thorough, independent inspection of their work. This ensures we live up to our commitment to deliver quality installations every time. Once you’ve decided to work with Maple, your part is pretty much done. Simply pass the order over to us, then sit back and relax, safe in the knowledge that we’ll manage the entire process for and on your behalf. Managing more than 12,000 jobs every single year we’ve learned the importance of having the right infrastructure in place. Once we receive your job details you order will be quickly and efficiently processed using our bespoke vehicle scheduling software. Our service team, based in a dedicated call centre, will liaise with the customer to schedule installations at a convenient time and place, from first vehicle to last. We’ll even manage partsflow via our distribution centre. An overnight delivery service ensures that parts are dispatched direct to our engineers for the next days jobs, enabling last minute schedule changes where required.